Whether you require a generic legionella logbook, or a bespoke site specific legionella control log book service you have come to the right place. 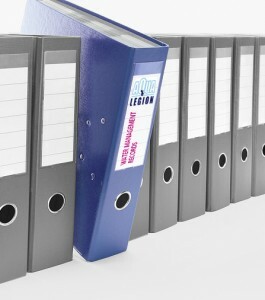 Our generic Legionella log books can be brought off the shelf and then customised for your specific needs. Alternatively we are able to provide a bespoke legionella log book formation and development service that will direct your operatives through the routine weekly, monthly, quarterly, six monthly and annually tasks as applicable. Our site specific Legionella log books are designed so you are guided to conduct certain tasks at the required time. The Legionella tasks are formally structure to guide the user to specific outlets and locations within the building to carry out the recommended tasks as detailed in the control scheme. In order for Aqua Legion UK to provide the bespoke legionella log book service, we will need a copy of your existing risk assessment and schematic drawings. Alternatively, one of our Consultants will be required to visit your site to collect the relevant data to form your site specific legionella logbook and records. As part of the generic legionella log book and records management systems there will be a generic control regime to provide an idea of the tasks required for the most common systems and the frequency such tasks should be implemented. There’s also generic method statements and instructions to guide the user when undertaking the routine tasks as required. Legionella Control and Management Records are required to document the routine monitoring and management tasks implemented to manage your water systems safely. The HSE’s ACOP L8 requires that suitable legionella risk management records be established. It is important to emphasise that the HSE’s Approved Code of Practice details the requirement for a site legionella log book to be established and that the legionella log book be readily available for review and inspection. This is particularly important if a legionella outbreak was to occur. The site legionella log book and records, electronic or otherwise should be utilised to log all tasks relating to water management and legionella control particularly. The importance of suitable Legionella control records cannot be emphasised enough. Likewise, the legionella records log book should be readily available to facilitate onsite inspections and investigations as and when applicable. Aqua Legion UK are able to provide a site specific log book to record the required information. If you do not have any legionella management records or require a new records management log book please do not hesitate to contact us.